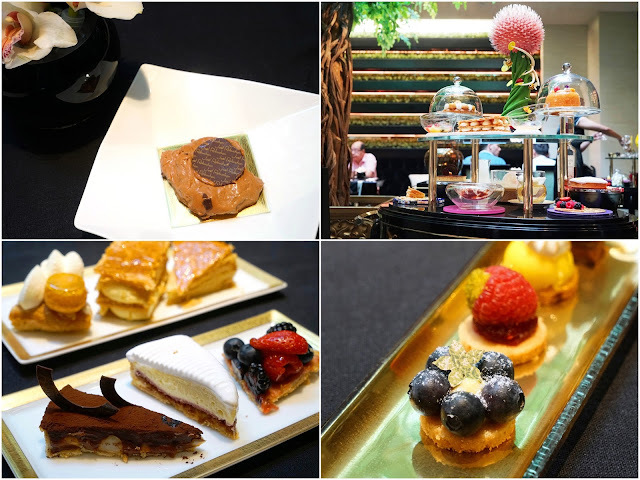 We visited L'Atelier de Joël Robuchon on several occasions, and each time our curiosity had us peeping into Joël Robuchon Restaurant and wondered about its offerings. It's only a matter of time that we make our reservation. The former is vibrant and stylish, while the latter exudes an air of refined elegance. 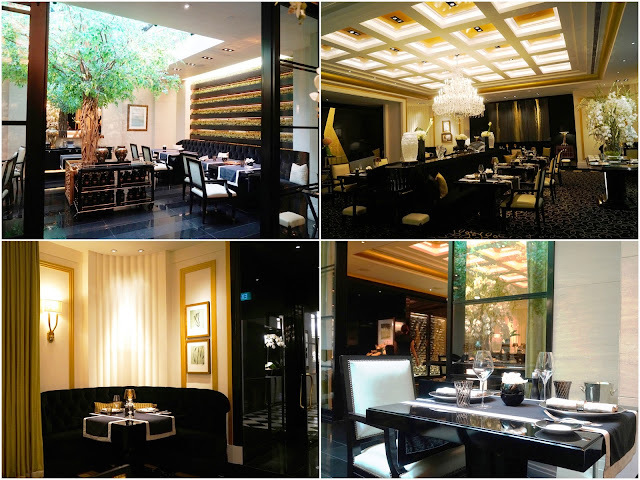 Joël Robuchon Restaurant's main dining area is designed to be an extension of Robuchon’s dream family dining room in an art décor style hotel. Decked in main tones of beige and black, it is indeed classy with a luxurious feel. Our table was within the indoor "winter garden" of the restaurant where a tree takes centerstage and natural light streams in through the glass roof. It felt comfortable, cozy, and none at all stifling. Having a meal in such loveliness will set you back by $248++, $298++, $348++ or $498++ depending on selected set menu for dinner. The group of us were there for lunch on a leisure Saturday, but this option will no longer be available in the coming year. One thing that will stay fondly in our memories for many years to come would possibly be the Bread Trolley. How to forget that three full tiers of freshly-baked goodness! The assortment from onion to foie-gras flavored ones enticed our senses with their heavenly aroma and pleased our mouths with a range of amazing taste and texture. Soft, fluffy, crusty, flaky, buttery... I can go on and on. But of course, we were mindful not to over-stuff ourselves with the bread as the Amuse Bouche, Appetizer, Soup, Seafood, Meat, Dessert and Petit Fours awaits. 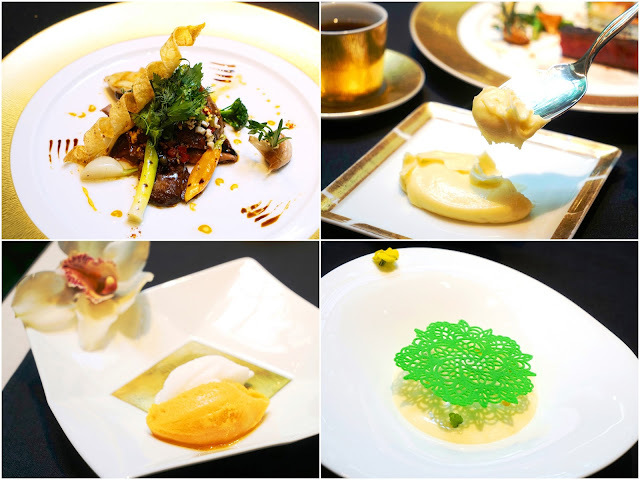 If first impression matters, then the presentation of the dishes certainly impressed. While raw delicacies usually doesn't resonate too well with me, my eyes couldn't helped but threw salivating glances at my friend's Wild Salmon Tartar (supplement of $30++) which was extravagantly topped with a layer of Imperial caviar. How visually arresting! The refreshing Seasoned King Crab Meat with avocado and crunchy vegetables on tomato coulis in vibrant shades of red and green was set to uplift even the most jaded appetites. My choice of starter, Green Bean with Foie Gras and parmesan cheese shavings might not sound too intriguing in words, but arrived looking like a delicate piece of art with components carefully placed together. I must say it has an engaging taste to match. 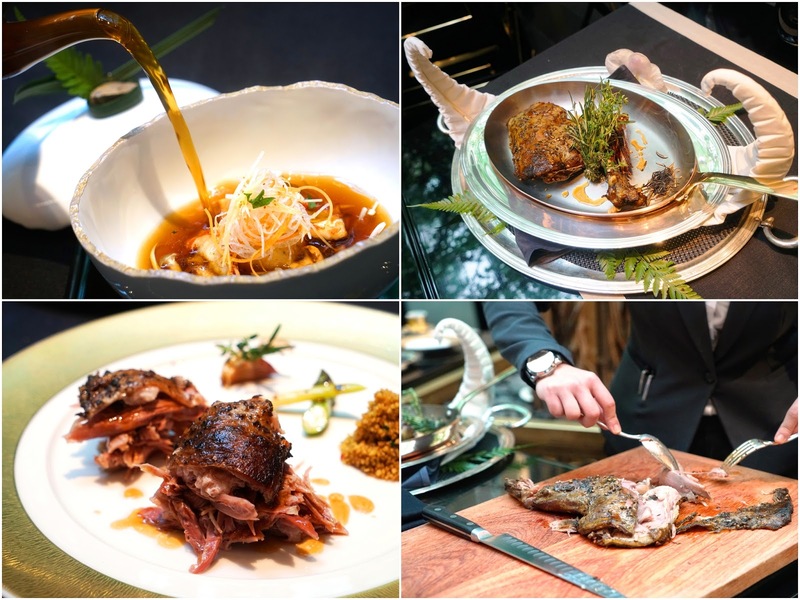 Some other highlights include the Poached Lobster in bonito broth, Pan-fried Hokkaido Scallop with spelt risotto and coral emulsion, Le Black Cod with bak choy and Malabar black pepper sauce, as well as the Iberico Pork Pluma featuring the well-marbled and succulent cut of Spanish pigs. Braised-roasted Lamb Shoulder provided some tableside action, and the portion is meant for two person to share. For beef lovers, go go go for the Grilled Wagyu Beef. The premium Japanese beef was brilliantly executed to a beautiful doneness with an ideal, tender bite. There was really nothing to fault about it, and I really don't mind having more of those luscious pieces lol. Candele macaroni pasta with mushrooms and parmesan shavings completed the dish. A noteworthy mention is Chef Robuchon's signature Pommes Puree which was all of velvety smooth deliciousness. Tip: You would want to beckon the server to scoop more of the mashed potato onto your plate when they come round the table with it. So moreish! Though we thought most of the fare to be generally lacking in the surprise element, it was nevertheless well-thought and well-executed. Coconut Sorbet, and Passionfruit Sorbet were served as palate cleansers before our dessert of Fresh Herbs & Chartreuse Verte Sabayon. Nice, but it was the Dessert Trolley that made our eyes widened with excitement. I almost squealed like a kid. All that enticing tarts, cakes and chocolates were for us to pick whatever we want! I gave up choosing after awhile because we decided to simply get..... everything! Just as we started to put down our forks, the Petit Fours Trolley was wheeled in! More chocolates, macarons and little treats! Some were a tad sweet, some were more delightful than others, some simply made my heart melts. You just have to find your favorites. What makes fine-dining, a truly fine-dining experience? 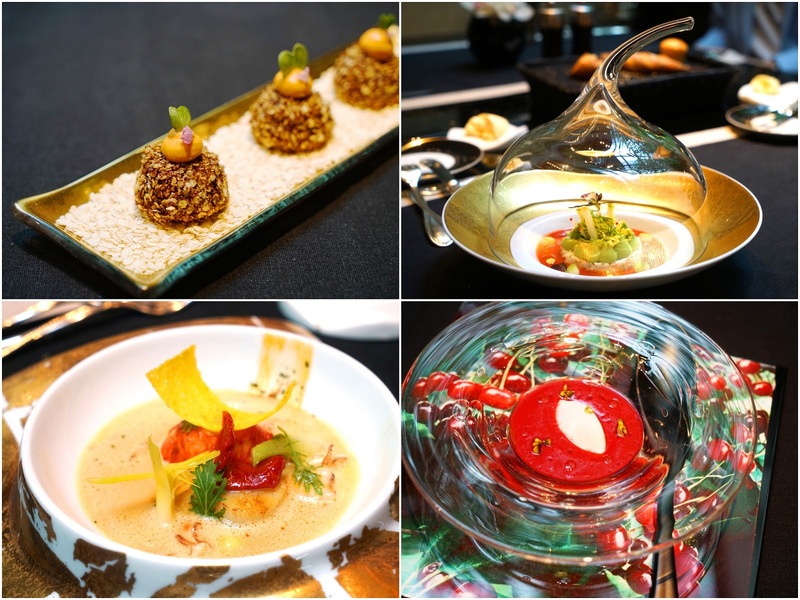 If we're talking about the finest food, impeccable service and excellent ambience meeting in perfect harmony, Joël Robuchon Restaurant definitely scored highly in my list. Perfect for birthdays, anniversaries, or any joyous occasions.